Discussion in 'Dovetail Live Article Discussion' started by TrainSim-Jay, Feb 22, 2018. 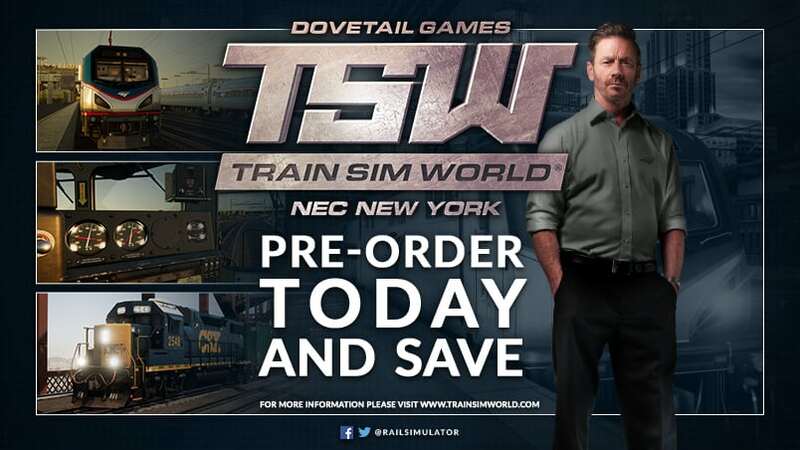 Arriving March 15th, Train Sim World: Northeast Corridor New York! Our next expansion for Train Sim World, entitled “Northeast Corridor New York”, captures the busy and vital portion of Amtrak’s electrified Northeast Corridor in and around the New York City area, and is Available to Pre-Order now! Really looking forward to this. One thing I noticed right off the bat was the freight track on Hell Gate bridge. It doesn't have catenary in real life, but you guys added it in. Minor flaw, but a flaw nonetheless. So is it from Washington to Boston? Is the route manual already prepared or still in progress? will it connect to the Csx Heavy Haul ? Quite dissapointed tbh, I already have this route in TS2018. Therefore I won't be buying this route. You could have done something new like the Metro North Hudson line. Not even close. Dovetail this time around is pretending that Amtrak operates a rapid transit route from New Rochelle and Newark. In the photos, there is only one freight car shown, a container car. Will any more new freight cars be included? Working freight tonnage is more than enthralling aboard the EMD GP38-2 in CSX’s distinctive ‘YN3’ livery, with the 50-foot Plate C Boxcar, 5201-Cubic-Foot Covered Hopper, 30,500-Gallon Tank Car, 73-foot Centerbeam Flatcar, 85-foot Open Deck Flatcar and Containers all ready and awaiting haulage. Is there any intention to put the other CSX locomotives into YN3? Would add a lot to the game e.g. traffic-wise. diversion etc. I am wondering; will there be speed limit signs available on this route? The NEC DLC for TS18 lacks speed limit signs, making it impossible to drive without HUD. I hope they will bring the Acela into the game sometime in the future seeing there is only two locomotives. From what I gather, there are actually no speed limit signs in real life, but in real life they rely on ACSES which, like PTC, tells the driver the track speed, as well as when to slow down and speed up at just the right time. If that’s done right (it was not quite done right in NY NH; it only told the current speed limit without considering the deceleration required for future speed limits) it should be possible to drive and obey the speed limits without the HUD. Ok, here's something of an open letter. I am thoroughly disappointed by the short length of the route. Why even call it the NEC if it's just the rails in and around New York. In my opinion this route should be at the very least a combination of the 2 already existing NEC routes in Train Simulator, the NYC-Philly and NY-NH. If you want my opinion on this I think DTG should pull this from release and extend it to at least those two destinations. I don't care how long it takes it just needs to be much longer. If DTG chooses not to do this then I hope there's an absolute myriad of freight trackage, not just including yards, to make up for the lack of length of passenger run. In all at the very least this route should be renamed "The Rails of New York" or something like that. Oh what about the timetable like it's been done for GWE and RT ? Know it's 3 weeks before it's even released but curious nevertheless. Somewhere on the Facebook page, in the comments for the NEC-New York DLC, TrainSimulator responded with, "We're working on the timetable it as we speak". That's about 40 miles with about an hour's worth of drive time. It took quite a while after release before the timetable for RT finally appeared so it's worth flagging it up now. Always glad to see more content for the game! Admittedly, I do share some of the skepticism expressed by others here in the forum but overall I am very excited to have this route added into the game. I'll be looking forward to see what else y'all add as far as route expansions and additional locomotives/rolling stock. Looks nice, but seems I'm not getting enough info. How far does it go? What are the key features? The route will go from Newark to New Rochelle and will feature Amtrak. They are also bringing over the GP-38 from Heavy Haul for some freight scenarios as well. I have been waiting for Amtrak since day 1 of TSW. Everything looks very good so far. I hope the sounds and physics are accurate too. There are only Approach Permanent Speed Limit signs on this route in real life and only in the parts west of New York Penn. Here is the one heading east toward New York just west of Newark International Airport station. It's for the upcoming 70MPH curve at the west limits of Hunter. I am looking forward to the newest addition to TSW looks great. New Rochelle to Newark Airport... that's it? Neither stations are a terminal for any railroad. I got excited over nothing. The only way I am purchasing this is if the freight scenarios compensate for the lack of Amtrak. Also, ACS-64 only? Not even the Acela? What a shock. Nice going guys. Can you provide us some statement about GP40-2 DLC compatibility with NEC? Or generally, how the TSW structure is designed? Expect similar reports once the route is released. I hope you guys appreciate constructive criticism. An hour of drive time with good graphics, good scenery and no bugs, then I would say that is fine enough for me, when you also take that fact, that here is a discount on preorder. I’ved rather have an hour of good and finished journeys, where I can enjoy the view of New York and see other trains and passengers, than an 4 hour trip with framedrops, passengerfails, train signals displaying red and speed display problems. TrainSim-Jay: will the complete fresh pond yard be included and accessible with scenarios and/or service mode runs? Or just a smal part of it? cActUsjUiCe : Yes if you google some pics of the hell gate bridge you see only 2 (freight) of the 4 tracks has some wires above it. Hell Gate bridge has only three tracks, not four. The two tracks with catenary above them (tracks #1 and #2) are for Amtrak. The third track is for freight and is not electrified. Here are some pictures from September 2015. The freight track on the far right clearly has no electrification. That makes sense. I always play Train simulator without HUD, (except the F5 HUD), but I have to use it on NEC because of alle the sudden speed reductions. I hope they fix it for TSW, or at least add Approach Permanent Speed Limit signs, as cActUsjUiCe mentioned above. Hell gate bridge did have four tracks at one point but yes now it'd down to three. TrainSim-Jay Will the steps on the Amfleets be operational? Also are there wooden ties where appropriate, not all concrete? Anthony, this is in response to our private conversation a few minutes ago. You were questioning if Hell Gate Bridge had all concrete ties like the DTG photo below. The answer is no. Here are two actual photos of the transition between concrete/wood on the mainline tracks. The freight track is 100% wooden ties throughout. Basically wooden ties on the main bridge section (to reduce overall weight and stress on bridge structure). Concrete everywhere else. Commercialization started be ready for tons of "TS" addons. Good to see new content here, but for me it's to early to produce more and more addons,without patches and repairs of already existing dlc's. Yep, big bad old DTG are going to start commercialising their commercial product. Perish the thought. Let's face the facts though; Train Simulators are a niche market. They're nowhere near as popular as flight simulators. The DLC model that DTG use for Train Simulator has served them well in the past and there's no reason to think DTG are going to do anything different for TSW. Now Jay has already stated, more than once, that we're getting a bugfix patch at the same time as the NEC release and Jay has also been hinting quite a bit that we're getting something for GWE quite soon. As for getting a ton of addons; I don't think anyone is upset by that. I'll take a Class 387, personally. Yup, this is what I was afraid of. Another graphics showcase by DTG. We've already seen all the "advanced, next-gen" graphics that TSW has. Now it's time to get to the actual simulation aspect of it. This route's main problem is (as everybody else is saying) that it's too short. Not only is it short, it's in an area of the NEC where the highest speed limit you're gonna be able to hold is around 70 mph. There are higher speed limits in this section, but they're so short lived that it's not even worth accelerating since you'll have to brake before you even get to the higher speed. The Northeast Corridor is all about speed. A much better alternative to this route would have been something like NYC to Philadelphia, or Philadelphia to Washington. I don't want to experience the NEC in TSW by driving an Amtrak Regional over the Hell Gate Bridge at 60 mph. I'd rather be flying through New Jersey and Pennsylvania at 125 mph. The only hope I have is that this route isn't intended as a passenger route and is more of an industrial freight route. There are a lot of options for industrial switching and local freight runs in the area between Newark and New Rochelle that could keep you occupied. But driving an Amtrak train back and forth through New York is just plain boring. Also, you talk about how "busy" and "challenging" the NEC is. That's mainly because of all the commuter trains that Amtrak has to share track with. There would be mainly 2 commuter railroads that would normally be seen on this section. New Jersey Transit between Newark and Penn Station, and the Long Island Railroad between Penn Station and the junction where the Hell Gate Line splits off. As a matter of fact, the LIRR is known as the busiest operator on the NEC just because of the amount of trains it runs on that short stretch between Woodside and Penn Station. I'm sorry, but you can't have the NEC without commuter trains. It can't just be Amtrak and CSX (or technically Conrail Shared Assets in this area). And please don't substitute the commuter trains with Amtrak equipment like you did in the original NEC route for Train Simulator. That's just pathetic. Here's my suggestion for a good NEC route. A remake of the original NEC route from Train Simulator between NYC and Philadelphia. Accurate scenery, stations, track layout, sound effects, and signals, a complete makeover from the horribly inaccurate and thin scenery of the original. There would be 3 trains included with the route. An Amtrak ACS64 with Amfleet coaches for the Northeast Regional service, an NJT ALP46 with Bombardier Multilevel coaches for NJT commuter service between Penn Station and Trenton, and a Septa Silverliner IV MU set (the Silverliner V would also work) for commuter service between Trenton and Philadelphia. Now I know there have been some licensing issues with Septa, so if you can't get a license, just make the Silverliners blank or unbranded. People will know what they represent. These 3 trains would operate the service mode timetable for the route. Also you could include the Acela Express and either a CSX or Norfolk Southern freight diesel as separate DLC addons after the release of the route. Believe me, people would go for it much more than this neutered and pathetic excuse for the NEC. If anybody wants to get this route, pre order it now so you can get it at the cheaper price. I would not want to pay full price for this thing. IIRC the very first MSTS in 2001 had the NEC from Washington to Philadelphia(?) with an Acela and AEM-7.